Flooding occurs annually in about half of Cambodia's 24 provinces. There is a lot of water but most of it is not drinkable. Over two million people living in a densely populated areas along the Mekong, Tonle Sap and Tonle Bassac Rivers. The water is contaminated with arsenic. 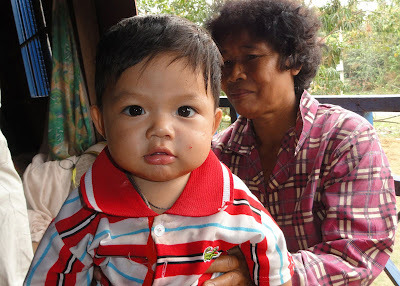 Ponleu is a 10 month old baby boy who has survived neonatal tetanus. When he was just 9 days old, he was brought to a hospital in Phnom Penh after he stopped sucking milk from his mother’s breast. He was constantly crying, his limbs were contracting and his body became stiff. He was cared for in hospital for 15 days before returning home to his father’s village in Prek Reusey district, Kandal province. Sokin Thorn uses a set of pictoral cards to provide health advice. Srey Neang is 18 years old and eight months pregnant with her first child. Working away from her home village with her husband and family, she had little access to health services and information. Class interacts with her pre-school teacher and classmates. It’s an early morning in Stoung district, 212 kilometres north of Phnom Penh, and a class of pre- schoolers at Treng State Pre-School sing the chorus of a traditional Khmer welcome song. Among those actively taking part in the twice-a-day singing ritual, is 5 year-old, Phat Ni Ta. Although Ni Ta is unable to speak, she observes her classmates intensely, mimicking their mouth movements whilst firmly holding onto a small soft ball. UNICEF supports NGO Goutte D'eau Rehabilitation Samarkun Centre in Poipet City, North-West of Cambodia (Border with Thailand). The centre provides rehabilitation and non-formal education for vulnerable children including art therapy (music, drama and acrobatics), sport and cooking. UNICEF has supported the centre since 2001. Mondul Kiri is north-east province of Cambodia where most of manority ethnic groups are there. To view the full photo captions, expand the gallery and click 'show info' in the top right corner.